The Constitution is not only the basic law of the country, but also the law that defines its development tendency. The persistence of the Constitution lays ground for the sustainability of the state. Although making amendments to the constitution is a common practice in any country, amendments do not necessarily improve the quality and intensity of the constitution. According to Professor Rosalind Dixon, Chicago University, USA, “An ‘amendment’ denotes the idea of ‘correction/repair or improvement’) and, for most commentators, constitutional amendment rules are designed to serve exactly these purposes – that is, to allow for the correction of or improvement upon prior constitutional design choices in light of new information, evolving experiences or political understandings”. However, as not every amendment is likely to improve the previous regulation, discussions on theory and concept on the basic structure of the constitution, which functions to protect fundamental concepts of the main law, have been done in some countries. In case of Mongolia, this process appears to be one of the absolutely new issues in the constitutional law. Constitutions of many countries provide for the principles containing fundamental and main features of their constitutions. It is considered that these principles should be in focus remaining in force at adoption of the Law on amendments to the Constitution. The notion on Basic structure of the constitution refers to conception of key constitutional principles that cannot be changed whenever. The frame of the notion on Basic structure is very definite, and it includes the provisions that are set uninfringeable by any constitutional amendments. Scholars have accepted that this was developed in the middle of 20th century, and was first defined by the famous lawyer Nambiar M.K. during the settlement of the case related to Golaknath of India. It is believed that he determined a conception on the basic structure after he had attended the lectures of Professor Dietrich Conrad on “Hidden restrictions to the right to make amendments to the Constitution”. This notion was accepted by the judge of the Indian Supreme Court Mudolkar J.R. in the settlement of the case of Sajan Singh, that had sensational response in the legal system of India. 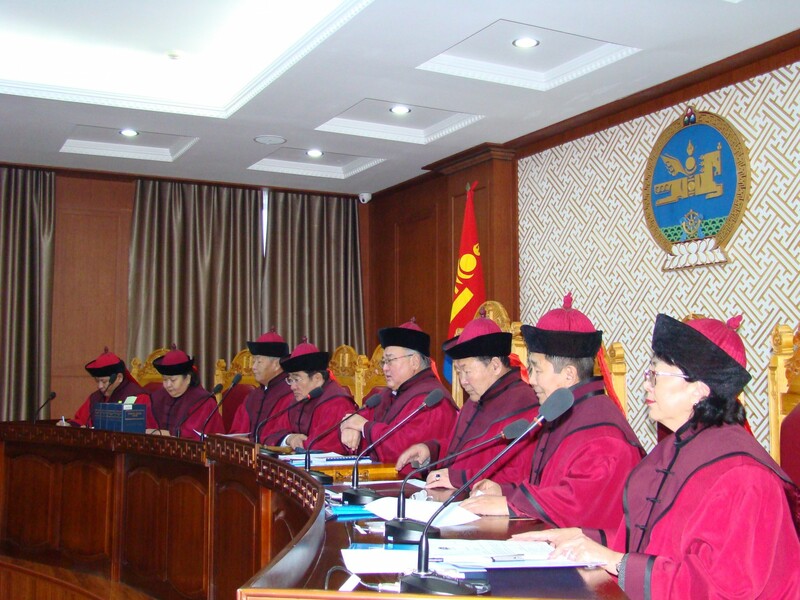 Unfortunately, in Mongolia, just few scholars published research works on basics tructure of the constitution. During the process of making seven amendments to the Constitution of Mongolia in 2000 and ongoing debates around this process the lawmakers and scholars reached in 2010 an ultimate agreement that there should be adopted separate law designated to regulate the procedures of making amendments to the constitution. Thus, a draft of the Law on Procedures to make amendments to the Constitution (Amendment Rules Law) was developed in early 2010, and further adopted by the State Ikh Khural (the Parliament) on 23 December of that year. The adoption of the Law on Procedures to make amendments to the Constitution introduced the new terminology “basic structure of the Constitution” to the legal system of Mongolia. Part 2.1 of the article 2 of the Law on Procedures to make amendments to the Constitution provides “When articles, parts and provisions that were not contained in the Constitution of Mongolia have been introducing to the appropriate chapter of the Constitution in new interpretation, they subsequently shall be referred as to the amendments to the Constitution, and be in compliance with the basic structure and fundamental concept of the respective Constitution”. Provision 5.2.2 of the article 5 of this Law provides for the determination of the content of the constitutional basic structure. In particular, it provides for the restriction to make amendments to the following provisions of the Constitution: articles 1, 2, 3 and 4; parts 1-4 of the article 5; part 1 of the article 6; part 1 of the article 8; part 2 of the article 9; parts 1 and 2 of the article 10; part 1 of the article 12; articles 14, 15, 19 and 20; part 1 of the article 20; part 1 of the article 30; part 1 of the article 38; article 41 and 47; parts 1 and 2 of the article 49; and articles 68 and 69. In other words, the articles, parts and provisions of this provision are considered to be the composition of the basic structure of the Constitution of Mongolia. It seems more appropriate to consider the above mentioned provision of the Law on Procedures to make amendments to the Constitution having constitutional competence (or power) in terms of the theory. The reason is that, the constitutions of many countries contain provisions to which no amendments can be made. However, that provision spelling “no amendments shall be made to this provision” was amended by the Law of 9th February 2017, and part 4 of the article 5, article 20, part 1 of the article 30, and part 1 of the article 41 were removed from the basic structure of the Constitution. Before discussing the reason why the above four articles and provisions were removed from the basic structure of the Constitution, it seems necessary to define precisely what provisions have been included into the basic structure of the Constitution. - Article 19 (1. The State shall be responsible to the citizens for the creation of economic, social, legal and other guarantees ensuring human rights and freedoms, to fight against violations of human rights and freedoms and to restore infringed rights. 2. In case of announcement of a state of emergency or martial law, the human rights and freedoms as determined by the Constitution and other laws shall be subject to limitation only by a law. Such a law shall not affect the right to life, the freedom of thought, conscience and religion, as well as the right not to be subjected to torture, inhuman and cruel treatment. 3. In exercising his/her rights and freedoms one shall not infringe the national security, rights and freedoms of others and violate public order). Article 22, part 1 (l. If extraordinary circumstances arising from sudden calamities occurred in the whole or a part of the country, the imposition of martial law or the outbreak of public disorder prevent the holding of regular election the State Ikh Khural shall retain its mandate until the extraordinary circumstances cease to exist and the newly elected members of the State Ikh Khural are sworn in). Article 30, part 1 (1. The President shall be the Head of State and embodiment of the unity of the Mongolian people). Article 38, part 1 (1. The Government is the highest executive body of the State). Article 41 (1. The Prime Minister shall lead the Government and shall be responsible to the State Ikh Khural for the implementation of state laws. 2. The Government shall be accountable for its work to the State Ikh Khural). Article 47 (1. 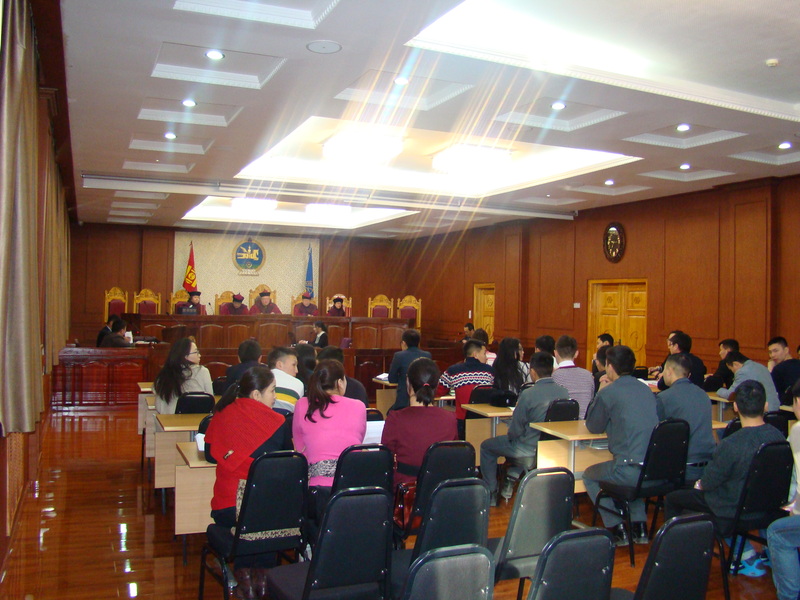 In Mongolia the judicial power shall be vested exclusively in courts. 2. The unlawful establishment of a court under any circumstances and exercise of judicial power by any organization other than court shall be prohibited. 3. Courts shall be established solely under the Constitution and other laws). Article 49, parts 1 and 2 (1. Judges shall be independent and subject only to law. 2. 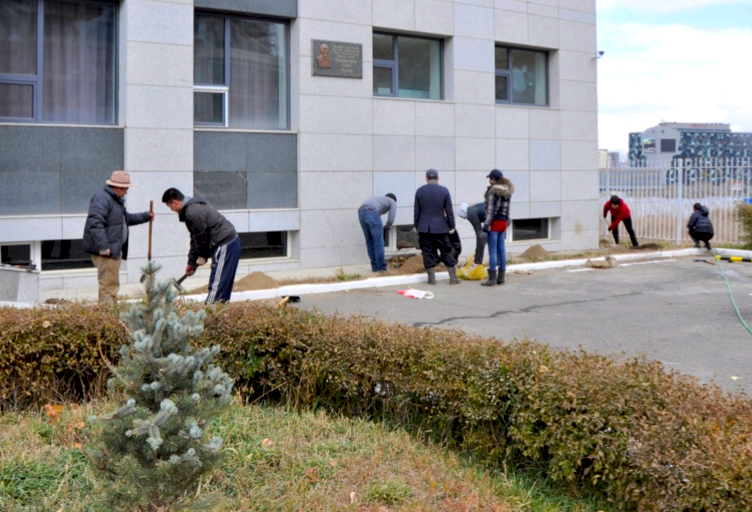 Neither a private person nor any official including the President, Prime Minister, members of the State Ikh Khural and the Government, officials of political parties or other mass organizations shall interfere with the exercise by the judges of their duties). Article 68 (l. Amendments to the Constitution shall be initiated by organization and officials enjoying the right to legislative initiative and could be submitted by the Constitutional court to the State Ikh Khural. 2. A national referendum on constitutional amendment may be held on the concurrence of not less than two thirds of the members of the State Ikh Khural. The referendum shall be held in accordance with the provisions of sub-paragraph 16 of Paragraph 1, Article 25 of the Constitution). Article 69 (l. An amendment to the Constitution shall be adopted by not less than three fourths of votes of all members of the State Ikh Khural. 2. A draft amendment to the Constitution which has twice failed to win three fourths of votes of all members of the State Ikh Khural shall not be subject to consideration until the State Ikh Khural sits in a new composition following general elections. 3. The State Ikh Khural shall not undertake amendment of the Constitution within 6 months prior to the next general elections. 4. Amendments which have been adopted shall be of the same force as the Constitution). It can be understood that in establishment of the basic structure of the constitution in the above mentioned frame there was an idea not to make amendments to the basic structure of the constitution and keep it stabilized. In broad meaning, lawmakers adhered to the principle that in order to be the determiner of the roots of social relations the Constitution of Mongolia should remain to be the basic law of the country. But it is important for the scholars and researchers to scrutinize why, or for what reasons, or what was the intention of the lawmakers to remove provisions of the article 5 (part 4), article 20, article 30 (part 1), and article 41 (part 1) from the basic structure of the Constitution. What I have found out after my observation is that the provisions of the article 20 of the Constitution spelling “The State Ikh Khural of Mongolia is the highest organ of State power …” and article 30, part 1, spelling “The President shall be the Head of State …”, which seem to infer that the above mentioned provisions (articles 5, 20, 30 and 41) were removed because lawmakers supposed that there might have arisen deeper controversies in such matters because of the differences between superior powers of the state and the hierarchy of powers in the future. That subsequently led to reconsideration of the separation of powers and re-establishment of the proportion of check-and-balance. The provisions 5.3.3 and 5.3.4 of the amended article 5 of the Law on Procedure of making Amendments to the Constitution and provision 6.1.1 of the article 6 of the Law on Referendum make this concept more explicit. Article 5, part 4 provides “The State shall regulate the economy with a view to ensure the nation's economic security, the development of all forms of property and social development of the population”, and I think it is necessary to determine more clearly the concept “state regulation” within the scopes of the economic theory of the constitutional separation of powers that has been in talks of scholars recently. Concept of the basic structure of the constitution has been developed in the international practice by the following two main ways: first, through making laws; and second, when resolving constitutional disputes through rendering decisions of the Constitutional Court or, in absence of such a separate court, through precedent established by the Supreme Court. Depending on historical traditions, culture and values, countries include various principles into the basic structure of their constitutions. For instance, constitutions of Algeria, Indonesia, Italy, Romania, Turkey and France provide for the preservation of the principle of republic country; constitutions of Algeria, Angola, Belarus, Brasilia, Dominican, Italy, Qatar, Kazakhstan, Honduras and Portugal provide for the sustainable maintenance of the principle of the separation of powers; constitutions of Algeria, Angola, USA, Brasilia, Qatar, Kuwait, Namibia, Portugal, Romania and Ukraine guarantee for the secure and respect of human rights and freedoms; constitutions of Algeria, Angola, Brasilia, Kazakhstan, Honduras, Romania, France and Ukraine provide for the strengthening of the integrity of the territory; constitutions of Algeria, Angola, Belarus, Brasilia, Portugal and Romania provide for sustainability of the principle of multi-party and electoral system. Many countries include the following principles into the basic structure of their constitutions: principle of democracy (Armenia and Czech), principle of the rule of law and respect for law (Angola and Czech), principle of multiform economic system (Portugal), principle judicial independence (Angola, Portugal and Romania), principle of national unity (Angola), principle of traditional statehood (Angola), principle that state powers vest in the people (Armenia). The constitutional provisions prohibited to be amended are as follows: in USA and India – concept of atheism; in Algeria – provision on Muslim religion as a state religion; in Angola and Portugal – provision on independence of church. And the Constitution of Romania includes the provision on national language into the basic structure of the constitution. There are countries whose constitutions provide for the immunity of provisions on basic structure with regard to certain circumstances, for example, in Luxembourg during the deputizing of the King, and in Kuwait during the deputizing of the Emir. In Estonia, France and Thailand, it is allowed to make amendments to the constitution only through referendum. However, the Constitution of Venezuela promptly provides for the prohibition to make amendments to the provisions pertaining to the basic structure of the constitution. The Constitution of Portugal has included the provision on independence of the Constitutional Court into the basic structure of its Constitution. It is an interesting issue that the process of implementation of the concept on the basic structure through court decision establishing precedent by the Constitutional Court and Supreme Court gives answers to many questions. For example, although the parliament of any country has the legislative power, it is still under dispute in some countries the question whether the power to initiate ordinary statute (or law) includes the right to make amendments to the constitution. They consider the procedure to make amendments to the constitution that is provided by in the constitution is only the procedural regulation norm, and is not the provision that entitle the parliament. The parliament of India, like the parliament of any other country, has the power to make laws. However, there has been the dispute on whether it has the right to make amendments to the constitution. Although the article 13 of the Constitution of India provides “… has the power to adopt laws”, the judge of the Supreme Court Subba Rao considered the article 368 as the provision that provides for the process of making amendments to the constitution, and rendered the decision related to the dispute claiming that the parliament had no right to make amendments to the constitution. In the settlement, he argued that lawmaking power included the right to make amendments to the constitution, and that right vested in the parliament. This decision has been a big progress in the development of the basic structure of the constitution. The Supreme Court of India included some principles into the basic structure of the constitution through rendering of decision establishing precedent, e.g. principle of highest control over the implementation of the constitution and separation of powers, principle of democracy and federal principle, principle of being the state apart from the religion, and principle of judicial independence, all together about 20 principles. Implementation of the conception on the basic structure of the constitution in countries of the Anglo-Saxon legal system through rendering decision establishing precedent is not relatively the same. The basic structure of the constitution in countries of this law family has generally been formed by the model of India, and the practice of creating thereof through rendering court decision establishing precedent has been extended beyond the countries of this law family covering such countries of Roman-German law family as Argentina, Columbia, Peru, Thailand and Taiwan, and has spread in Caribbean countries in limited scope. Legal norms of common law and continental law systems have become much closer in past fifty years. In the resolution of the case related to Rio by the Supreme Court of Argentina in 1930, it was considered that the amendments to the constitution shall be discussed by in the Parliament exclusively within the scope of the project draft, and in the resolution of the case number c-551/03 by the Constitutional Court of Columbia, it was rendered the decision on unavailability to renew the entire constitution through making amendments. When discussing the reforms of the Pension system in 2005, the Constitutional Court of Peru announced that it had the right to dismiss amendments controversial to the basic structure. The Constitutional Court of Thailand rendered in July 2012 the decision on prohibition to adopt the amended constitution to be adopted through the public referendum. And the constitutional amendment on the principle of proportionality to the election system was adopted by the decision 499 in 2000 based on the grounds that the National Assembly had to be composed of the MPs because the Constitutional High Court of Taiwan had not been chosen. In this settlement, they referred to the court decisions of Turkey and Germany. The constitution adoption processes In Malaysia, Singapore and Sri Lanka are different, and as the Supreme Courts of these countries consider that the Parliament has right to make amendments to the constitution, they do not accept the concept on basic structure. Although the Constitution of the South Korea of 1948 did not specifically provide for the amendments, the researchers deem necessary to provide for some restriction to the right to make amendments to the constitution. In case of Japan, the three principles, in particular the provisions regarding the powers of the Emperor-head of the state, principle of respect for the human rights and freedoms, and principle of neutrality (non-participation in any war) are deemed the fundamental principles of the constitution. The concept on basic structure of the constitution is the concept that prevents from the infringement of the fundamental conception of the constitution through making amendments to the constitution, and intends to protect the main law of the country from such attempts. Nowadays, when an issue on making amendments to the constitution has reached such a big extend, it is vital to study this concept, study the experience of other countries. The reason this concept has arisen is connected the first with the fact that the parliament has seen itself having unlimited lawmaking right, the second with the situation that many amendments have been made to the constitution recent years, and the third every amendment has not improved the respective relation. I agree with the conclusion of researchers and scholars that in order to maintain the constitution stable the notion to protect the constitution from unnecessary and deteriorating the current provision amendments has become widespread, and the international tendency regarding this has already focused on the “concept of the Basic structure”. According to this tendency the concept of the Basic structure appears to be important securing means aimed to protect the constitution from as Roscoe Pound said “Constitutional amendments of unconstitutional character made by constitutional means”. Although Mongolia has established the basic structure of the constitution through adoption of the separate law, there are just few countries that have created the basic structure of the constitution through the same means. If we compare Mongolia with other countries, many of them include the principle and provisions regarding the basic structure of the constitution in the content of their constitutions. Mongolia has established the basic structure of the constitution through separate law, which has made the basic structure transitive. The transitive character has made the basic structure vulnerable and susceptible to potential amendments of the parliament. This situation is proved by the act of lawmakers regarding removal of the above mentioned four articles. Thus, it would be appropriate to determine and include these few major principles into a special single provision and incorporate in the Constitution, because one of the goals of the concept of basic structure is to protect the constitution from political interference of the Parliament. On the other hand, this prevents from the opportunity to damage the basic structure of the constitution through amendments or make deteriorating the current provision amendments. In Mongolia, article 68 of the Constitution of Mongolia provides “Amendments to the Constitution shall be initiated by organization and officials enjoying the right to legislative initiative…”, which means that either the President or PMs or Government member has the constitutional right to initiate the Law on Amendments to the Constitution. As well as the following principles of highest power of the Constitution, republic country, conception on establishment of civil society, national unity, appropriate society, sovereignty have been included into the basic structure. Romanov A.K. “Law and Legal system of Great Britain”, 2010. Forum Press, p.17. translated by Davaadash Ch. Ibid. ‘Rios’, [1994-C] L.L. pp.46,48.